I’ve observed that there are typically 2 ‘sides’ / camps when it comes to the subject of pumpkin spice. People either really, really, REALLY love it. Or, they absolutely despise it. Pumpkin spice scented candles and Glades make appearances. I’ve even seen pumpkin spice scented bathroom spray down the toiletries aisle of one my local grocery stores- which, I think is taking it a little too far. There’s pumpkin spice scented shampoo, lotion and body soap. Again, I feel pretty sure that this is taking it too far; why would you want to literally ‘smell’ like pumpkin spice? Why can’t we just let our pumpkin spice obsession stay in its lane, in areas that it can shine the best without being too extra or just plain ridiculous? You know a really good place/fit for pumpkin spice? Baked goods. 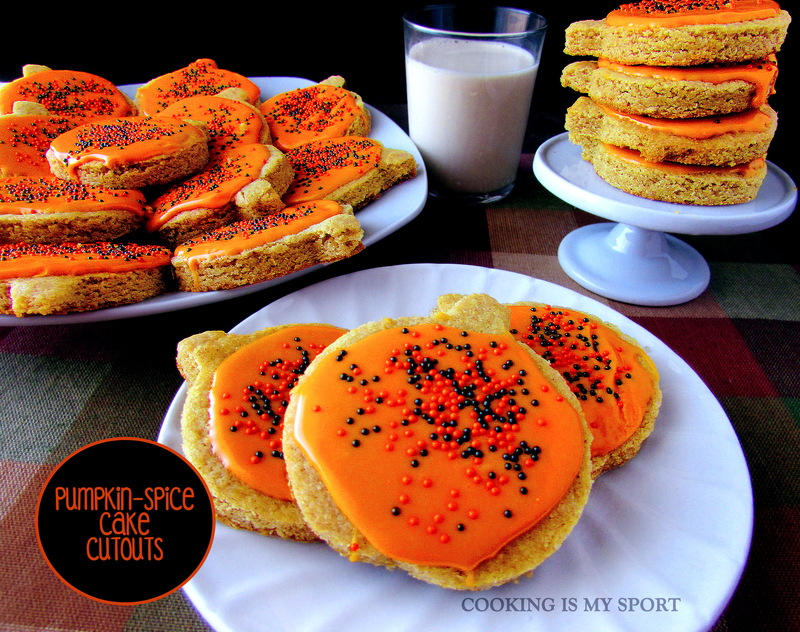 There are very very few baked goods that can’t be improved with pumpkin spice. 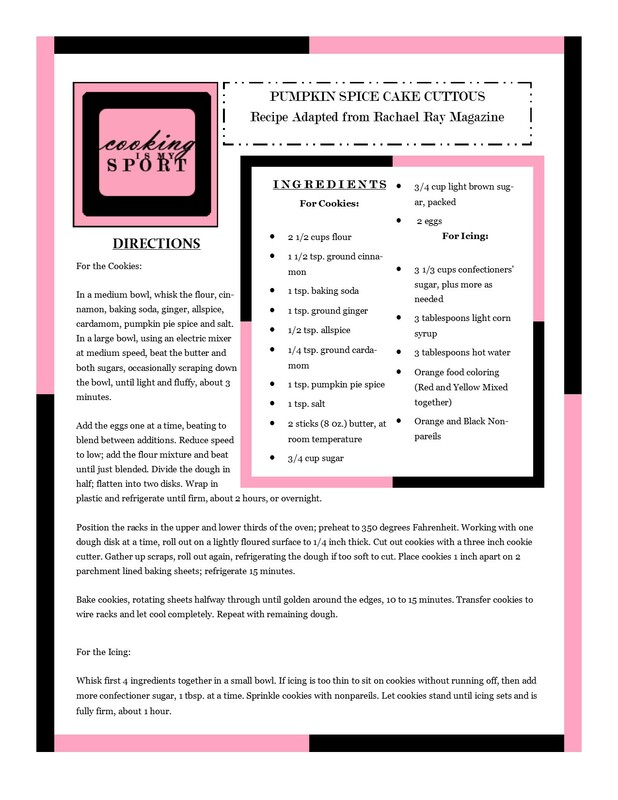 I found that out when I adapted a recipe I saw in Rachael Ray magazine for cut out style cookies that were meant to mimic the flavors of a spice cake. What with all the pumpkin spice craze going on, I thought that maybe I could try and apply it to something that makes sense. The flavors of pumpkin spice and spice cake actually aren’t all that different from one another, so I figured that it couldn’t be that hard to pull off successfully. So what I did here was adjust the flavors of the base spice cake cookie dough. Then, just to be “cute” with it, used pumpkin shaped cookie cutters and made an orange hard icing to spread on top with some Halloween sprinkles. As cut out cookies should be, these are thick and soft with just the right amount of chew. And heating them up for about 10 seconds in the microwave makes them practically melt in your mouth. The pumpkin spice is noticeably prominent but still SO good. 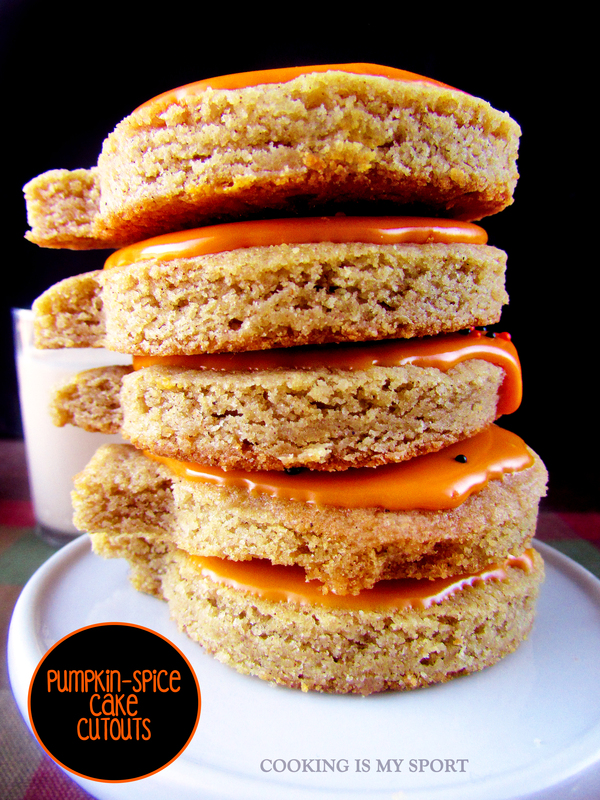 You really do get the feeling that you’re eating a pumpkin flavored spice cake- except it’s a cookie. And a really good one at that, which means I’m really happy with how these turned out. Happy Halloween to all of you wonderful people, especially those at this week’s Fiesta Friday #92. In a medium bowl, whisk the flour, cinnamon, baking soda, ginger, allspice, cardamom, pumpkin pie spice and salt. In a large bowl, using an electric mixer at medium speed, beat the butter and both sugars, occasionally scraping down the bowl, until light and fluffy, about 3 minutes. Add the eggs one at a time, beating to blend between additions. Reduce speed to low; add the flour mixture and beat until just blended. Divide the dough in half; flatten into two disks. Wrap in plastic and refrigerate until firm, about 2 hours, or overnight. Position the racks in the upper and lower thirds of the oven; preheat to 350 degrees Fahrenheit. Working with one dough disk at a time, roll out on a lightly floured surface to 1/4 inch thick. 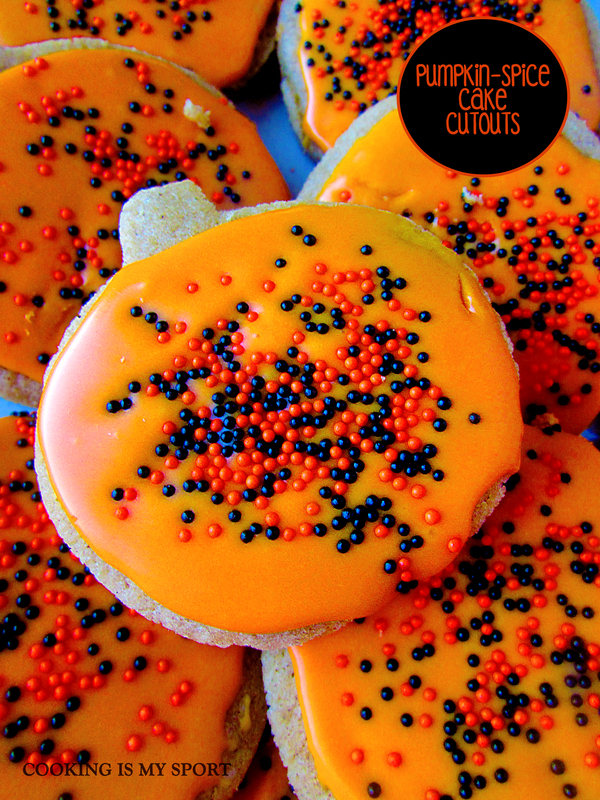 Cut out cookies with a three inch cookie cutter. Gather up scraps, roll out again, refrigerating the dough if too soft to cut. Place cookies 1 inch apart on 2 parchment lined baking sheets; refrigerate 15 minutes. Bake cookies, rotating sheets halfway through until golden around the edges, 10 to 15 minutes. Transfer cookies to wire racks and let cool completely. Repeat with remaining dough. Whisk first 4 ingredients together in a small bowl. If icing is too thin to sit on cookies without running off, then add more confectioner sugar, 1 tbsp. at a time. Sprinkle cookies with nonpareils. Let cookies stand until icing sets and is fully firm, about 1 hour. Happy FF to you too though, enjoy the Halloween weekend! Love those cake cutouts, I really love the spicing, warm spices are my favorite. Those cookies would make a great whoopie pie too I bet. 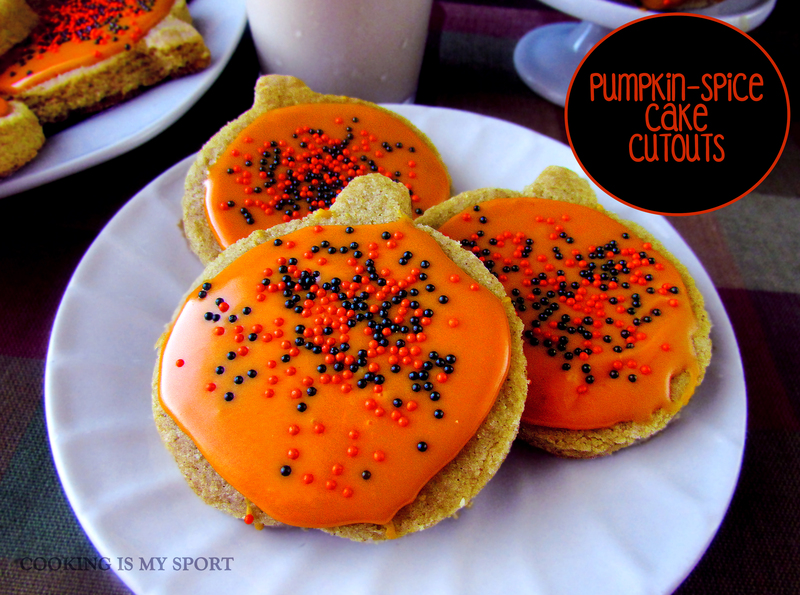 Jess, these cookies look adorable and so moist and delicious!